In June 2006, the LA City Council officially went on the record supporting California Senate bill 1806. The bill outlaws leaving an animal in any unattended motor vehicle under conditions that endanger the health or well-being of the animal due to heat, cold, lack of adequate ventilation, or lack of food or water. This important bill was approved overwhelmingly by the Legislature last summer and signed by the Governor in September. I am proud to have helped co-author this groundbreaking legislation. API has launched its summer initiative, “My Dog is Cool,” to save dogs and other animals from dying in hot cars during warm-weather months. Every year, dogs die after being locked inside cars while their humans leave them, often for “just a few minutes.” These tragedies occur with alarming frequency, yet the animals’ deaths are completely preventable. ** NOTE: A Stanford University test found that even if it’s only 72 degrees outside, a car’s internal temperature can rocket to 116 degrees within an hour. Hundreds of dogs are unintentionally killed or injured each year by being left in hot cars, even with windows cracked and only for a short time. The lifesaving Web site http://www.mydogiscool.com is a free, friendly resource to help spread the word about the dangers of hot cars. Resources include downloadable posters and “It’s hot!” flyers that can be used when a dog is left in a hot car, and an “Is it Too Hot?” weather forecasting tool that allows you to just enter your zip code and see if it’s too hot to take your pal along in the car. The MyDogIsCool.com site provides everything you need to know to keep dogs safe and happy during hot weather. The Animal Protection Institute is a national nonprofit animal advocacy organization working to end animal cruelty and exploitation through legislation, litigation and public education. Indoor Animals — Make sure your house doesn’t turn into an oven during the day while you’re at work. If you don’t have an air conditioner, leave as many windows partially open as you can to keep the air circulating. Moving air is important. Your dog or cat will follow the air currents around to find the most comfortable spot. You can help by filling several liter-size plastic Coke/Pepsi bottles with water and freezing them. (Don’t fill them too full because ice expands.) Leave them lying on the floor around the house in places where your pets like to hang out. They can snuggle up against the icy bottles and keep at least a little cooler. Outdoor Animals — If your dog or cat spends the day in the back yard, it would be great if they had a dog/cat door that would let them come inside to cool off. If they don’t (how about a doggy door into the garage? ), you need to make sure they have some shady spots to get out of the sun and plenty of water to drink so they can stay hydrated. Give the ground under bushes or in shady areas a good watering before you go to work so your dog has a place to stay comfortable. You can always give your pal a bath later. Drinking Water — Whether your pets stay inside or out, make sure they have plenty of cool, clean water to drink. Leave several large bowls in different parts of your house or yard where your pets like to go and make sure they stay out of the sun so the water doesn’t get too hot to drink. 1. Exercise your dog in the cool of the early morning or evening, never when it’s hot. Be careful not to let your dog stand on hot asphalt or cement, as its sensitive paw pads can easily burn. 2. Some animals need extra special care in hot weather, especially those who are elderly and overweight, or have heart or lung disease. Hopefully, you know who you are. 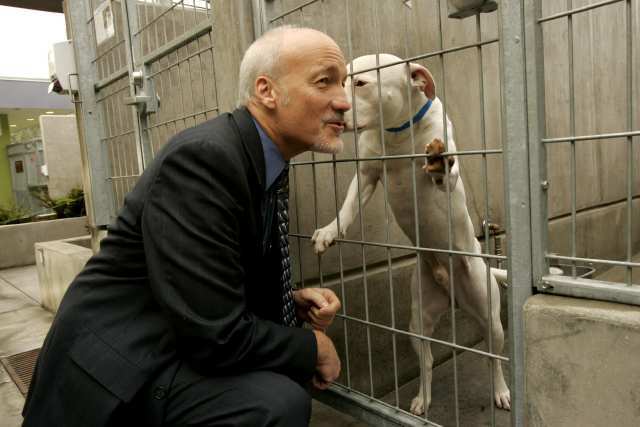 Despite a 3.45% increase in the number of dogs and cats rescued by LA Animal Services in the first four months of calendar year 2007 (from 11,532 to 11,930), the City’s euthanasia rate continues to decrease! The euthanasia rate for Calendar Year to Date compared to the first four months of 2006 shows a 13.25% decrease (from 3198 to 2774)! Keep in mind that 2006 was a historic record year for euthanizing the fewest number of animals and now 2007 appears to be on track to be another record year! Adoptions Year to Date are up 2% (from 4349 to 4437) and New Hope placements are up 3.2% (from 1919 to 1982). LA Animal Services continues to lead the nation in returning lost pets to their frantic and grateful owners with a 1.2% increase Year to Date over last year (from 1385 to 1402). This rate is four times higher than any other large municipal program. April 07 showed a 5.3% increase in the number of animals rescued by LA Animal Services (up from 3395 to 3577) compared to April 06. The continual increase in the number of animals coming into LA City Animal Care Centers demonstrates the need for widespread support of the California Healthy Pet Act (www.cahealthypets.com). Despite this increase in numbers, LA’s April euthanasia rate is the lowest April ever recorded, down a whopping 22.7% (from 1099 to 849)! This follows March’s historic all time low euthanasia month! Although Adoptions were down 5% (from 1102 to 1044) our New Hope partners picked up the slack and adopted 9.4% more animals this April than last April (from 622 to 681)! While these numbers may appear to paint a rosey picture to some, I want to make sure we don’t fool ourselves with respect to the challenge before us. LA Animal Services is criticized from both sides. When euthanasia is up we are criticized for being a “death camp”. When euthanasia is down we are criticized for being a “concentration camp”. LA Animal Services walks a very difficult line – we must try to maintain a high quality of life for our sheltered animals while attempting to not unnecessarily sacrifice the life of any animals when we need more space for incoming animals. 1. When an animal is healthy and has a good disposition, we hold that animal for at least 45 days to maximize our efforts to adopt it out. Most municipal shelters hold animals for a week or less. During those 45 days staff becomes well acquainted with each animal so as to better plead its case to both adopters and our New Hope partners. If after 45 days none of our 120 New Hope partners or anyone of our 4 million residents steps up to adopt an animal, we then stress the urgency for help with that animal by posting him/her on a seven day Red Alert on our website. This step provides anybody and everybody one last opportunity to save that animal. Even then this is not an automatic death sentence. Staff can, and often do, take animals off the seven day Red Alert when they think that animal just needs a little more time. That is how and why we often have animals in our Centers for months at a time. I cannot find ANY municipal shelter in the world that DOES MORE to save lives than LA Animal Services! 2. LA Animal Services will continue to promote adoptions and will continue to find ways to maximize the resources of our New Hope Partners. Working with our New Hope Partners, LA Animal Services is placing nearly 21,000 dogs and cats every year. I cannot find ANY animal adoption program anywhere in the world placing more animals than LA Animal Services. And we are committed to doing better! In addition to that, we reunite over 4,000 lost pets with their owners each year! Please help us promote our current Be Kind To Animals Week Adoptathon in which we offer half off adoption fees! 3. As many of you know, LA Animal Services is in the process of vacating our East Valley and West LA Animal Care Centers to move into our new facilities. Our new facilities will increase our holding capacity by over 400%! So what to do with our old facilities? LA Animal Services is developing a Request for Qualifications to identify one or more animal welfare organizations willing and able to manage our old facilities in partnership with LA Animal Services and in support of our No-Kill goal. 4. LA Animal Services continues to provide more and more spay/neuter surgeries for the pets of our residents each year, nearly 40,000 pets in 2006 and we are on track to do 44,000 in 2007. I cannot find ANY municipal program ANYWHERE that is doing more to provide spay/neuter services to its residents. Later this year we will be opening our Spay/Neuter Clinics in order to provide even more spay/neuter services to our residents. South LA’s Spay/Neuter Clinic is already operational and we hope to have North Central operational soon, with five additional clinics coming on line no later than next spring. 5. LA Animal Services is one of the original drafters and supporters of AB 1634. Now we have the support of the Mayor and the entire City Council! Our efforts on this state initiative laid the foundation for us implementing a City spay/neuter ordinance which is on a parallel track even now. Never was more being done to end the senseless killing of lost and homeless animals in the City of LA! I want to thank every employee, volunteer, and partner in helping us achieve the remarkable numbers of the last five years. But we have a long way to go and we need your help. Please consider ways of helping support the above initiatives, and/or consider joining our Volunteer Program. Its an old but true maxim, that if you are not part of the solution, you are part of the problem. Be Kind to Animals Week was the first large-scale campaign to bring attention to animal welfare in the United States. The idea extended from “Mercy Sunday”, a partnership between American Humane and clergy in several states. But the need for a more cohesive, nationwide campaign was seen as a natural outgrowth of the association’s mission and its collaboration with humane societies throughout the country. The inaugural Be Kind to Animals Week, May 17-23, 1915, was a revolutionary concept. With radio in its infancy, and long before television, American Humane effectively used the media of the day to promote the observance in 43 of 48 states. Posters and literature were distributed, and local newspapers helped publicize the events, resulting in a tremendous response. Over the years, Be Kind to Animals Week has continued to grow and embed itself into the popular lexicon and the public’s consciousness. In 1973, the children’s TV show Romper Room promoted it, and in 1990, Congress passed a resolution declaring May 6-12 as Be Kind to Animals Week and National Pet Week. It also has been featured in thousands of news stories and even in comic strips, including Dennis the Menace and Mutts. LA Animal Services is celebrating Be Kind To Animals Week with a week-long Adoption Promotion to encourage Angelenos to do the kindest thing of all – provide a loving home to a homeless pet. From May 6 through May 13, all adoption fees will be reduced by 50%!